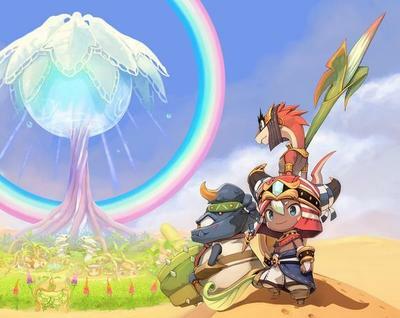 Nintendo has revealed a brand new IP called Ever Oasis that it is creating in collaboration with Grezzo. For those that don't know, this is the company behind the Ocarina of Time and Majora's Mask remakes on the Nintendo 3DS and part of the horribly underrated The Legend of Legacy. Grezzo's creative lead and founder is also a name that JRPG fans hold in very high regard. Koichi Ishii was a Square employee way back in the 90s were he created and directed many of the beloved classics in the Mana franchise. Final Fantasy Adventure, Secret of Mana, the Japan-only Seiken Densetsu 3. He made them all before leaving the company in 2006. Now he works with Nintendo, and Ever Oasis looks like a return to form. The art, music, gameplay, and lore behind this exciting new title are very reminiscent of the older Mana games to the point where one could call it a "spiritual successor." No release date on Ever Oasis yet, but it will be coming to the Nintendo 3DS.